One of the hardest things to organise when choosing a way of exercising as a family is finding an activity to suit everyone. All members of the family will usually excel at different things, and, more importantly, will enjoy different things. Therefore there may well be some activities which you will have to rule out because you will know straightaway that they are not going to appeal to everyone. For example, yoga may be a great idea if you are a mother and daughters, but teenage sons are unlikely to want to take part in such an activity. So, when you are trying to decide how to keep fit as a family, there are a number of factors to consider. 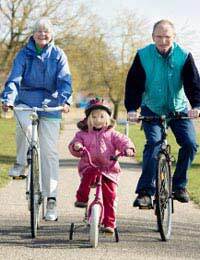 The respective ages of your family are an important factor to consider when looking at which activity to choose. If you are going to be taking part as a family of adult parents and teenage children, your ability levels are likely to be a lot closer than if you are including grandparents and small children as well. This does not mean that you cannot exercise as a family if the age range is wider, but it does mean that you will need to think more carefully about what you choose. If you are including small children, it is best not to choose anything which is too skills-based as they may struggle and then get disheartened quickly. If the older members of your family are not as strong as the younger members, you may need to think about choosing an activity which is low impact. The gender of the family members involved in the activity will not always make a difference but may well do. It is more likely to be a factor if you have teenagers and youngsters who are concerned about looking ‘cool’. This is where there is likely to be the biggest conflict between family members, as teenage boys and girls may not want to do the same type of activity. But a compromise can always be reached. If your daughters prefer dance-based exercises while the boys would rather play football, then look at something completely different from either of their choices which they may both enjoy, such as swimming. As well as age and gender, one other important factor to take into consideration when choosing an activity for the whole family is that the exercise should be something which can be enjoyed as a joint exercise, while doing it. In this respect, sports such as cycling, walking and running are ideal. The family can still chat whilst taking part in them but can also be competitive and not lose sight of their goals. This would not always be possible with something such as aerobics, where there is no competitive element, or football, where it would be tricky to be able to enjoy each other’s company while taking part. If you do not manage to find an activity to suit everyone then the whole point of exercising as a family will be lost. In fact, if one family member is left out because the activity does not suit them at all, there may even be a chance that there might be a division in the family caused by the activity – which would be at direct odds with what you were initially trying to achieve. Therefore, make sure everyone is happy with what you have chosen before you all get too hooked on it.